Let your kids play "doctor" for the day with our our Giant Operation game! This game is BIG FUN and will delight and entertain your guests! This classic game is more fun because of its size! Your guests have to use their patience and steady hands to "operate" and win the game! 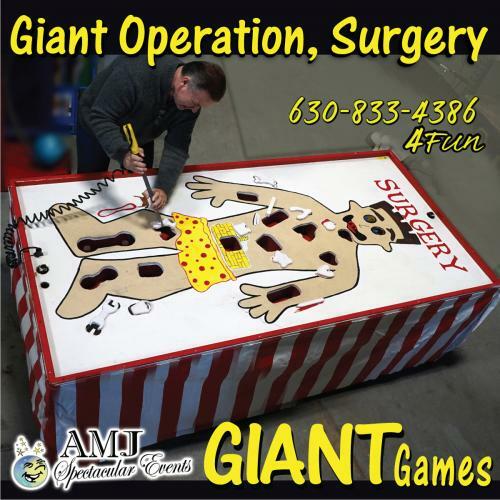 Giant Operation is fun for all ages and sure to be a hit at your next event! Fun fairs, sporting events, fundraisers, block parties, birthday parties, and corporate events...our Giant Operation game is the perfect addition to your event! Have your guests stack up some fun and excitement or maybe spark some friendly competition with this unique and oversized game. Looking for other, fun inflatable games to make your event spectacular? Check out our Giant Connect Four, Giant Light Bright, Giant Jenga, and Giant Kerplunk! We have everything you need to have a GIANT classic game themed party! Let AMJSE take care of all the work - we will deliver, set-up, and take down your Giant Operation, so all you have to do is enjoy! Contact us now to talk about this, other fun games, or about the hundreds of other rentals we have ready to help make your party a spectacular event!